Healthy living: This focuses on promoting a healthy lifestyle with activities like meditation, promotion of sports and Yoga among the many others. Clean up Club: This focuses on finding permanent solutions to problems like the garbage disposal, open defecation, spitting, through various volunteer and sponsored programs which ultimately aim to make Goa the cleanest state in India. The Clean Up Drive successfully ended up collecting 10 bags of garbage which mostly consisted of empty beer bottles, plastic bags including empty food packets. Understanding that cleaning one beach won’t solve the existing problem of garbage disposal in Goa in a day, the cause was supported by the volunteers with the idea that bringing awareness with such cleanliness drives can go a long way. 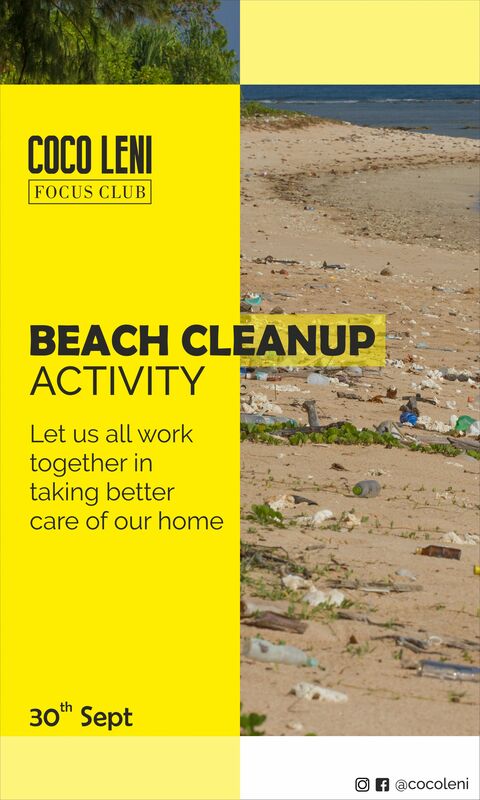 In order to bring about these changes, the Coco Leni Focus Club is organizing their very first ‘Beach Clean Up Activity’, takes place on the 30th of September, 2018 at the Caranzalem Beach in Panjim. The cleanup drive will begin at 10 am and is open to anyone who wishes to join us in our journey to retain Goa as a pristine and beautiful state. Come, volunteer to be a part of an oncoming change!